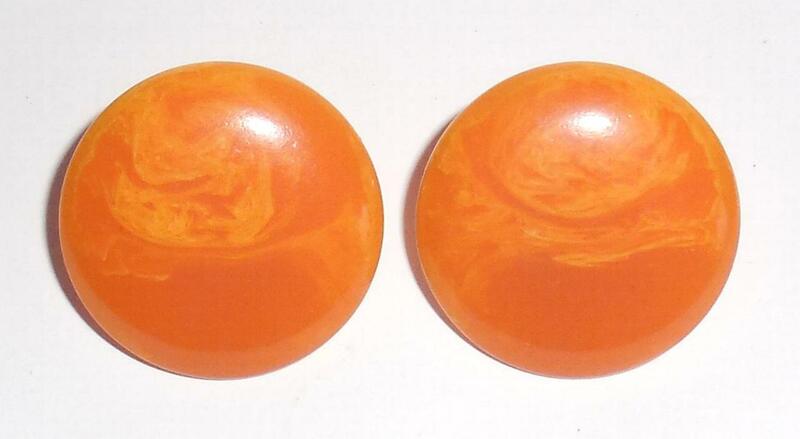 Lovely pair of vintage 1960s marbled orange to peach plastic and gold plated clip on earrings. These were old stock that were found in the basement of an old jewelry boutique that closed around 25 years ago. There is no wear and they are in excellent condition. The clips are strong and you can hear the loud snap when you close them. Size of each disc is 28mm or 1 1/8" across in diameter. They are a lovely flat matte orange color with peach marbling and look like bakelite. 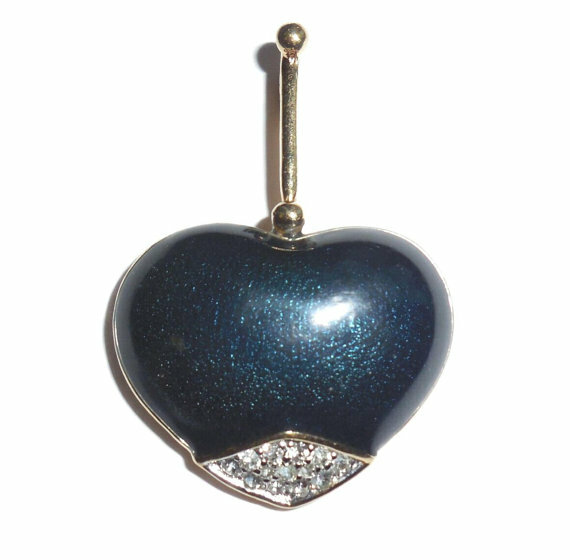 This is a chunky retro signed PANETTA blue with silver flecks pyrite glass puffed heart and rhinestone pendant. Excellent Condition. No gold wear. Great color with lots of flecking. It is very heavily gold plated and has a hidden bale. Size is 1 7/8" tall by 1 1/4" wide. Photos are enlarged for detail. The rhinestones are very bright, clean, clear and sparkly. 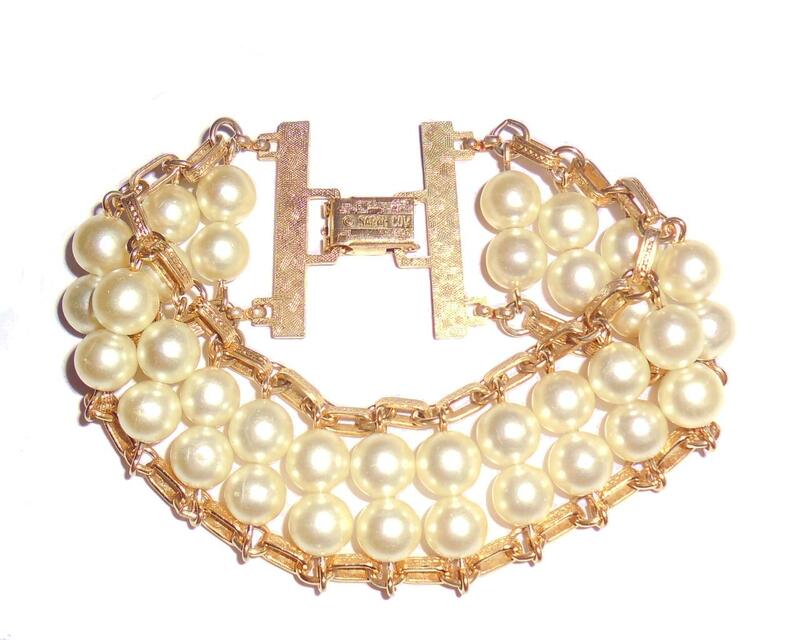 Just add a chain and you will have a gorgeous showy vintage statement necklace. This is an original 1970s or earlier (pre Frey Wille) Austrian handmade Michael Frey enameled floral pin. It is signed Hand Made, Michaela Frey, (Aichberger), Wiener. 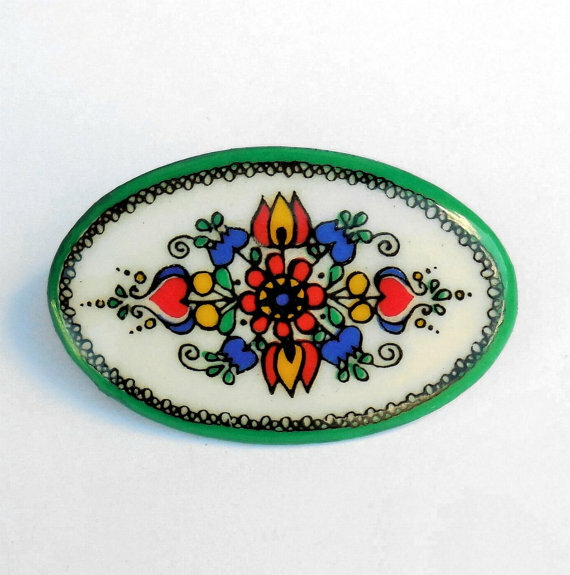 It is very well made, hand painted with bright, colorful enamel work on metal. It also has a strong metal locking clasp. Size is 1 11/16" long East to West by 1 1/8" tall North to South. Condition is excellent. No damage or repair. This is a lovely artistic statement pin for your vintage jewelry collection. It is very bright, colorful and showy with high quality enameling. Vintage Purple Amethyst Glass Pearls Fancy Brooch Pin Large Florenza - from an old jewelry store estate this is a gorgeous unmarked mid century Florenza purple faceted glass cabochon brooch with a strong antique finish to the heavy gold plating. There is a chip on one facet at the edge where it meets the frame on one side. The purple amethyst glass measures 25mm long and isa able to be replaced if desired. As many collectors of these old Florenza and Goldette pieces know oftentimes it is either unmarked or the marking is more often underneath that thick gold finish. They were so heavily plated that oftentimes the markings were covered with gold. Florenza was well known for its mid century cameo and art glass jewelry. This piece has very fancy filigree with tiny cut work on the gold edges. Very intricate and well detailed. Other than the edge chip to the glass it is in this perfect no wear condition. No wear to the antiqued gold finish. No filigree damage etc…. The faux pearls are 2mm and the 2 black rhinestone accents are about 5mm each. Size of brooch north to south is 2 1/4″ north south by 2 1/8″ east west. Locking clasp is strong and works well. 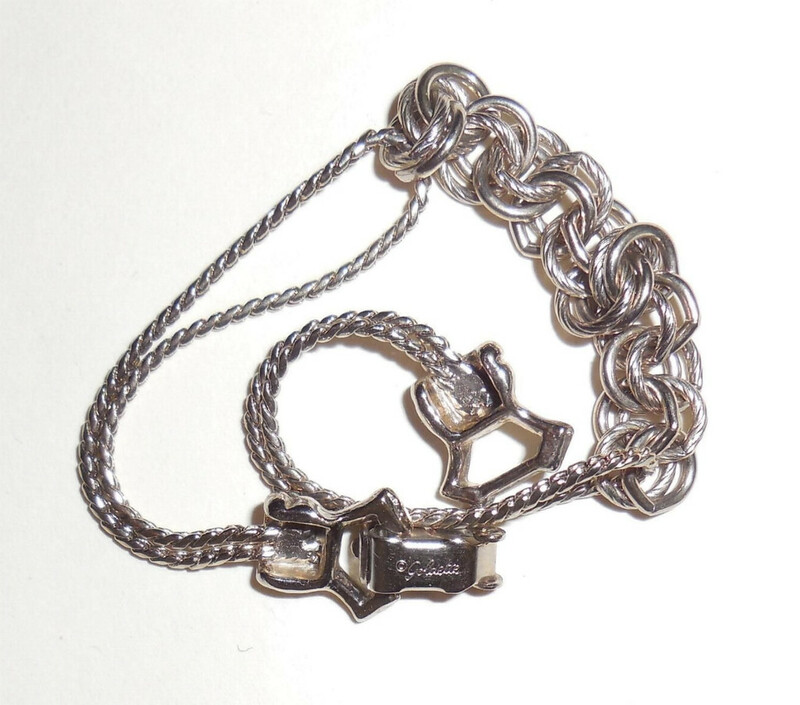 This is a lovely old addition of vintage mid century Florenza jewelry for your collection. 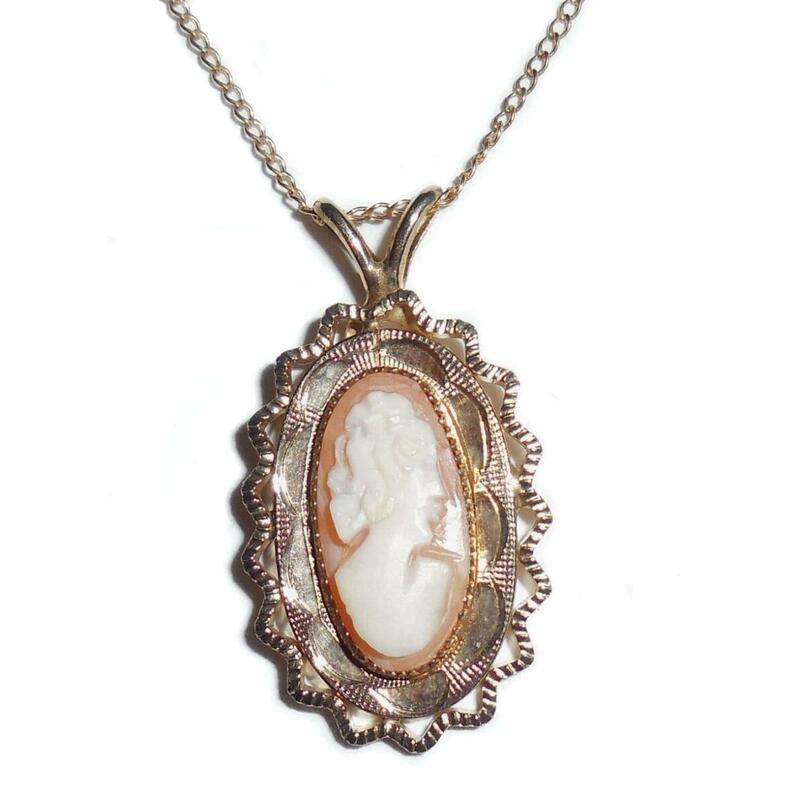 Please read more about unmarked Florenza jewelry below on this page in the product description. Rare and hard to find pierced large vintage bakelite buckle. Tortoise orange amber translucent brown and marbled green colors. Simichrome tested and guaranteed old estate bakelite. 4 1/2" by just about 2 1/2" This size is for both pieces closed together as a buckle. Hand made, Hand Cut, Hand Pierced Open Work. Hand cutting on one of the green pieces is slightly slanted. Other than this and a little surface age wear it is in excellent condition. No cracks or chips or deep scratches or repair. 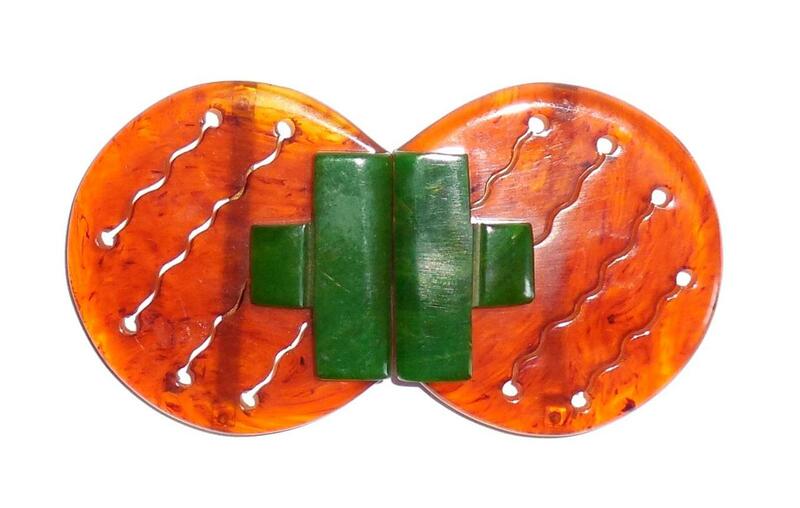 Fabulous 2 color pierced authentic original vintage bakelite buckle for your collection. 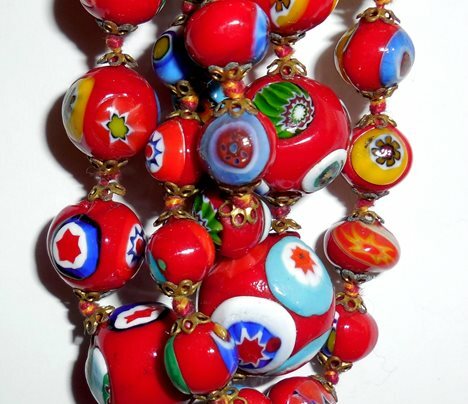 A beautiful bright red vintage 1950s hand made Italian Millefiore hand fused glass necklace. Size is 29.5" long and the beads graduate from 7mm to 16mm. It has an old brass barrel clasp and small fancy filigree connectors which have some wear. Other than this it is in excellent condition. The colors are vivid and strong; bright reds, greens, whites, blues, yellows etc...Weight is heavy at 80.7 grams. This is a beautiful, colorful, showy necklace for your collection. Old Store Stock from the 1960s-1970s. Beautiful, crisp, clean, never used condition. This is a small pair of 12mm vintage hand carved and hand dyed Natural Material ivoryne gold plated/filled pierced post solitaire daisy earrings in excellent condition. These can no longer be imported. The dyed material is very light weight. Excellent Condition. Completely Original. Never repaired. 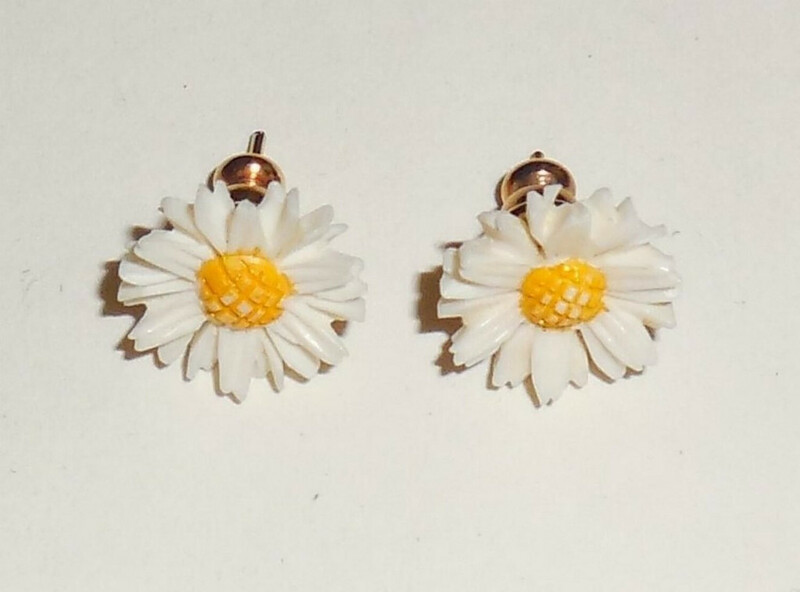 A lovely pair of vintage hand made daisy earrings addition for your vintage jewelry collection. 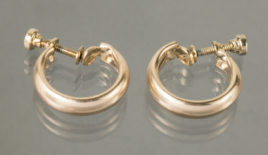 This is a small pair of vintage light rose gold filled/plated screwback huggie bangle earrings. Old store display stock and excellent, no gold wear condition. They have that antique look and feel that you only find on older jewelry….light rose gold color with a soft feel. They were stored away for a good 40 years in marked packages…….gold filled/plated. The gold has never worn away and retains its original soft luster. Some of these had light aged patina which easily polishes clean. Size is 5/8″ tall North to South by 5/8″ across the center East to West. These are great for everyday use and will easily stay in place with the screwbacks. 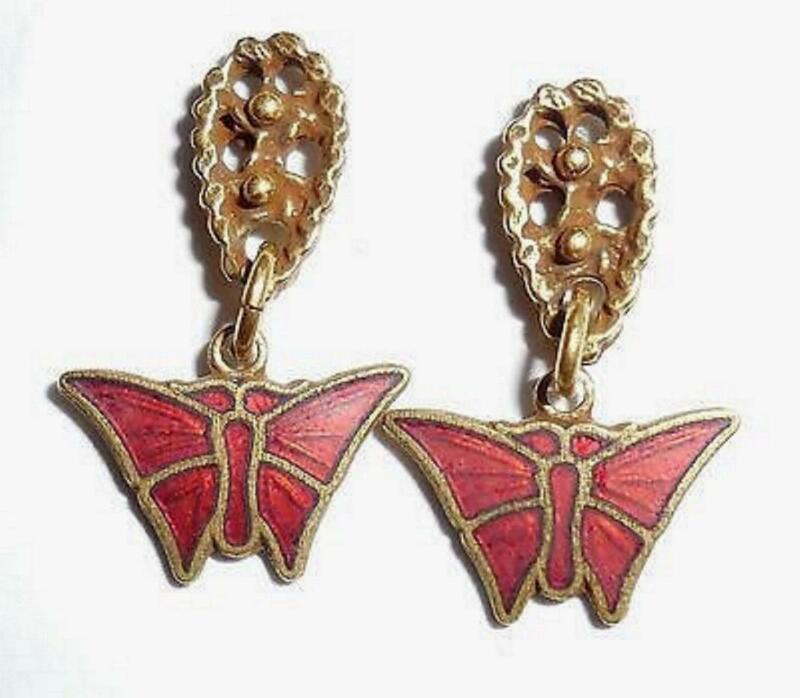 A lovely pair of earrings for your vintage jewelry collection. 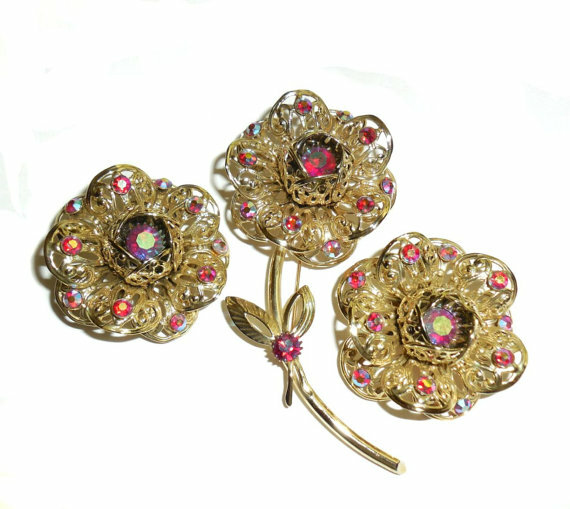 Very large sized vintage Sarah Coventry fancy filigree red Aurora Borealis pin and earrings set of blooming roses in beautiful, never used condition. The earrings are clip on and almost 2" across with a big depth/height of about 3/4" tall. The pin is 4" long and also has a depth/height of 3/4" tall. These were a gift that original owner put these away decades ago and never used them. No sign of wear. Original beautiful condition fancy fun costume group for your collection. 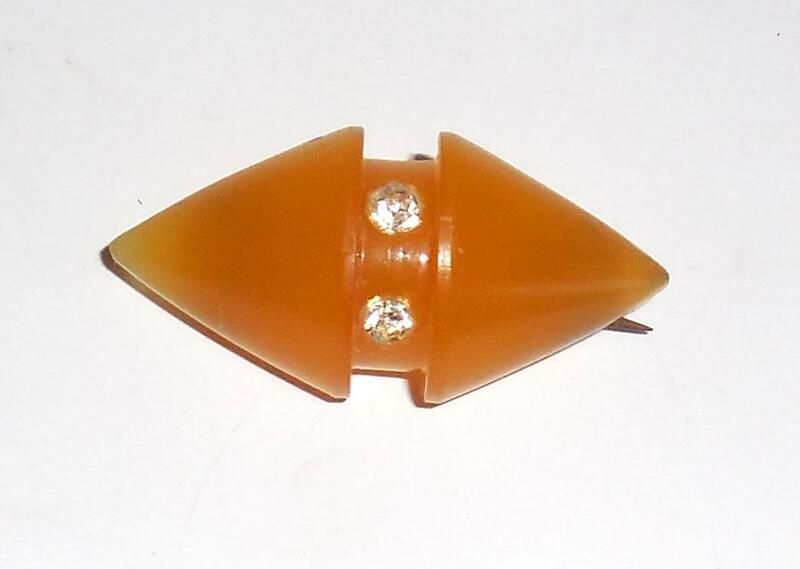 Vintage Art Deco Translucent Butterscotch Carved Geometric Celluloid Pin with old Austrian Swarovski crystals. 1 3/8" by 5/8" Original C Clasp Other than one small (very small, 1mm) edge flake it is in original, excellent condition. 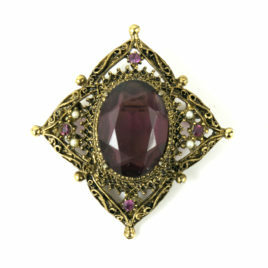 Lovely authentic vintage accent brooch for your collection or display. Austrian Swarovski crystals make this pin bright and showy! *****Actual Color is more of a light muted yellow, brighter than photo, more like butterscotch candy. 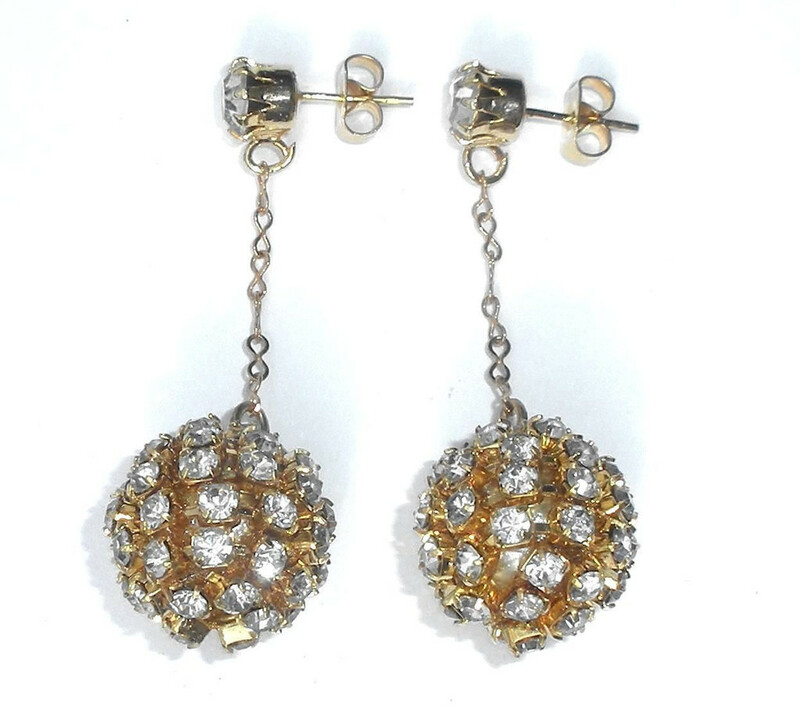 This is a pair of vintage heavy gold plated Swarovski Austrian crystal large dangle ball earrings. They are old store stock from a 1960s-70s jewelry store and were only ever used for display. Perfect, brilliant, no damage condition......very clean, bright and sparkly. They were found with the original old packaging for the Swarovski crystals. The stones had the Swarovski logo and the wrapping paper said Made in Austria. Size is 1 1/2" from top of crystal post to bottom of ball. Width of each ball is 15mm. They reach halfway down to the nape of the neck. A gorgeous pair of Swatoski earrings for your vintage jewelry collection. Very noticeable and look stunning. 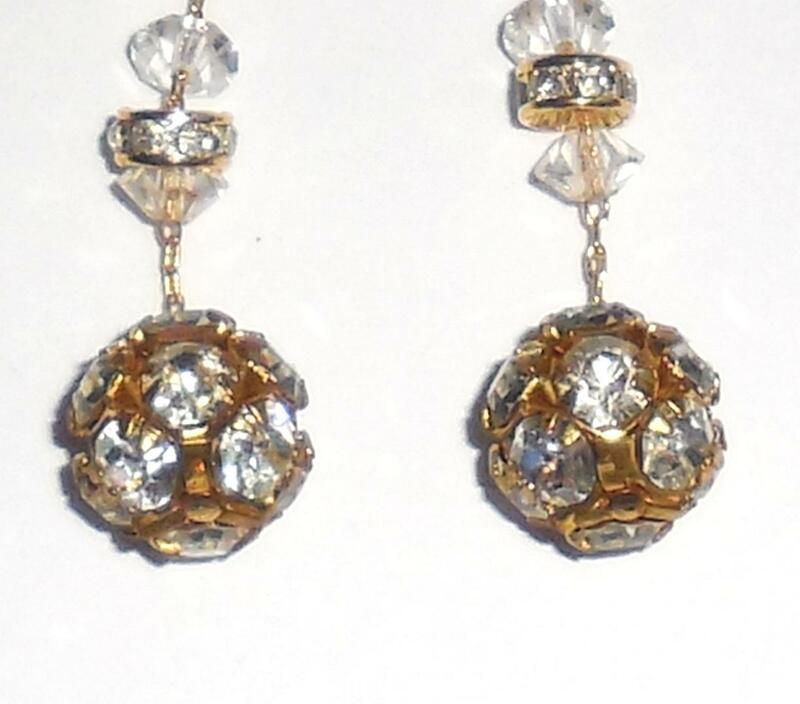 This is a pair of vintage Swarovski crystal large ball dangle earrings. New old store stock estate find! No wear condition. Never used. From the estate of NY distributor they were found in a box with Swarovski Swan logo envelopes containing the original stones. Assembled in NY back in the 70s and 80s. The wire hooks are light rose gold filled/plated while the dangles and chains are yellow gold plated. Size of each earring is just over 1 11/16" from top of hoop to bottom of dangle. The bottom crystal elements alone are 10mm tall without the top loop. All stones are as crisp and clear as when they were originally made. This is a showy pair of vintage statement earrings for your collection. 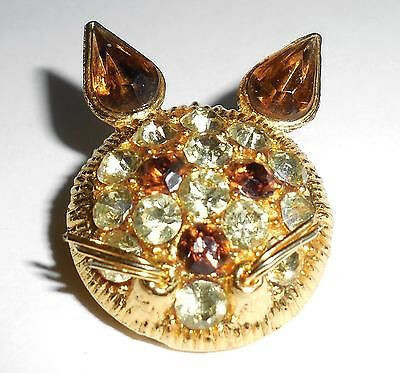 This is a vintage heavy gold plated kitten/cat pin with nice clean crisp clear Swarovski crystals/rhinestones in lemon citrine and brown topaz color. Beautiful, excellent, ready to wear condition. One small spot of wear to the pinback only. All gold is intact and still shiny and clean. Size is 1 1/2" tall North to South from tip of ear to bottom of pin. East to West it is 7/8" wide across. This is a lovely vintage statement pin in great condition. 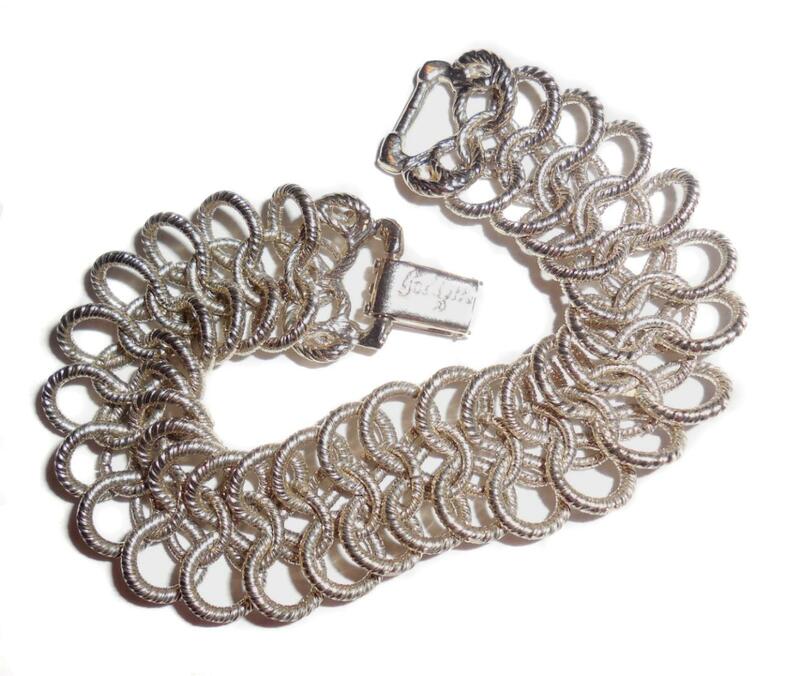 Good for any occasion; sparkly and showy. Also a nice addition for a cat jewelry collection.